LindaThiemann ... Fine Art Created with Fiber - "Going Green"
This composition started with a piece of royal blue silk. Roving was hand shaped into discs in the colors of cream, yellow, tan, and green and these were lightly need felted onto the fabric. The piece was then wet felted, and when dried it was machine stitched around and over the discs in a free-motion fashion. Various yarns were felted or couched over many of the discs, and the piece was trimmed to its present shape. 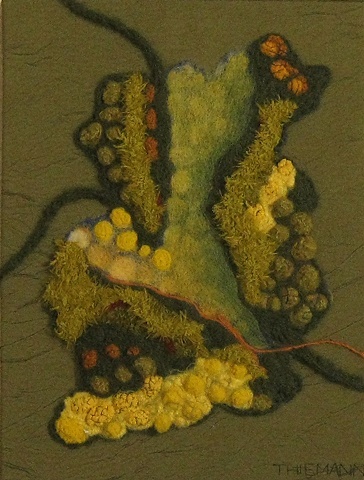 Areas were overfelted with light green eyelash, dark green mohair, and yellow wool yarns. And the remaining area of discs and blue silk backing was overfelted with a light layer of roving done in blended colors in a painterly fashion. The felted piece was then hand stitched onto a stretched canvas covered with a crinkle-type of silk.